One of the bigger surprises in the memory foam market has been DreamFoam’s gel model, which is 13 inches of heaven as described by some satisfied customers. A major competitor to Tempurpedic, DreamFoam is usually the option of those that want the same quality as the bigger brands but want to spend half the price. For the most part the company has delivered in an excellent way, giving customers what they want in every way possible while also passing the savings to them in a way that bigger brands can’t. In the case of DreamFoam, the gel line serves as a good indicator of what to expect from their other models that don’t have gel in them. This one comes in a multitude of sizes, and is 100% USA made with USA components. The company also makes it a point to compress the mattresses for a short period of time. This in turn gives it less off gassing than other competitors since it isn’t sitting in a box for months waiting to be opened. Buyers will also notice that it expands a lot quicker as a result, and is ready to go twice as fast as the others. Dreamfoam Mattress is a very popular brand online and by word of mouth, and the company has been in business since 1995 and have made it a point to create comfortable brand busting mattresses since their creation. The website is simple and contains an up to date blog about the company as well as sleeping and buying tips. They can be contacted by phone, email, or through live chat. So to say the least they are prompt with their support if anything should go wrong with their product. There is a 20 year warranty that is iron clad, as you always want the warranty to be shorter than the company’s current time in business. In this particular situation their 20 year warranty equals their company’s current lifespan, so users should feel safe in knowing this isn’t a company that will pack up and leave anytime soon. They offer a lengthy 45 day trial if you want to try out the mattress, and if you’re unsatisfied they will pick up the bed for you. Dreamfoam Mattress is a confident company that many users should have no problems dealing with when buying a new mattress. Sizes available are twin, twin xl, full, queen, king and California king. It’s a nice full range of sizes that are constantly rotated so that what buyers want is always in stock. 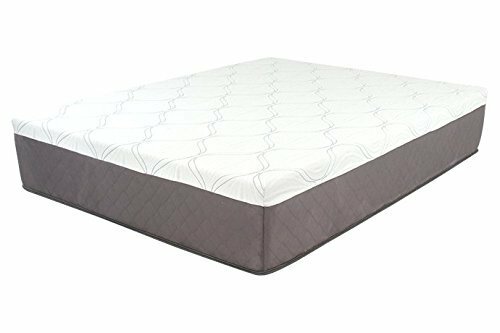 Of the 13 inches in the mattress 3 inches are the great feeling gel memory foam, the middle is 2 inches of 5 pound memory foam and the bottom layer is 8 inches of premium base foam. It really feels just as good as what the bigger brands are offering, and has some softness advantages too. For consumers in warmer climates the gel solution works wonders since it offers a maximum amount of breathability in the mattress without compromising softness. The cover is nothing too special, but it is however a nicely knitted cover that works better in the looks department than as a functional cover. Product dimensions are 80x60x13 and the weight is 105 pounds for the queen size. This is a big, grown adult mattress that is very durable and is built to last for years on its foundation. Like the other products in their line it is firm but idles on the softer side of mattresses to make you feel like you’re sleeping in a cloud. Starting with the 3 inches of gel memory foam on top, which would be one of the best features to concentrate your buying efforts on. It’s soft, plush, and it’s thick enough to where it makes a big difference in the mattress rather than just being a thrown in feature. Buyers will be amazed at the difference between a mattress that offers 3 inches of gel memory foam as opposed to half of that. A variety of sizes are available and their usually in stock year round, with one of the favorites being the twin xl for guest rooms and the California king for master bedrooms. Included is a 20 year warranty along with an easy to use website if you need to chat to live support and don’t want to call it in. And if you do decide to call it in, the wait time is nowhere near obnoxious as other companies. The extra heft of 105 pounds makes a big difference in how the bed holds up over time with different weight classes, and also with how well it handles multiple people being on it at all times of the year. Tempur’s Cloud Luxe is the perfect comparison, which is an almost $4,000 grand mattress by comparison. That is a very big leap in terms of quality vs price, and many have often defaulted to buying the DreamFoam version sand saving thousands of dollars in the process. Both mattresses are extremely soft and favor that feel over firmness, but the nod as far as a comfortable night’s sleep by regulating body temperature would come from DreamFoam, since theirs is a gel solution. Whether the DreamFoam beats it in comfort is going to be up to the individual user that tries them out. It’s not really a hard sell to make when hundreds of customers make the comparison to a Tempurpedic and say that the DreamFoam is just as good and in some cases better. The DreamFoam also uses 3 inches of gel which was a smart decision when compared to the Cloud Luxe, which has the best memory foam in the business, but still can’t compete with the cooling effects that gel provides. DreamFoam also managed to keep the mattress soft yet give it a solid foundation so that it last for years without any defects. It has remained high and won’t go down any further since they are already giving buyers a good deal. No big sales have taken place in the last couple of years, and stock is strong but will probably not remain that way with people realizing the thousands of dollars they can save by buying this brand for better sleeping nights. If consumers can find a deal that offers about $30 dollars less than what the going rate is for it then by all means jump on it, as it is already a bargain at the current rate they set. The winner in this product is without a doubt going to be the 3 inches of gel memory foam that the company introduces to the customer. That is a hard to argue with feature, that even bests some of the better brand names in the industry that offer high quality product and guaranteed sleeping nights. A long 20 year warranty and 45 day trial period round out the many positives that DreamFoam has to offer to the public as an up and coming mattress manufacturer. Buyers can always try out the Cloud Luxe and make their opinion between the two quite easy. If saving a couple of thousand dollars means going with the mattress that has the worse cover between the two, then it becomes a very easy decision.